Tom's Hardware recently did a follow up to their ray tracing article specifically on Voxel Ray Casting. I thought it was a good review of the technology and did a good job presenting the pros and cons associated with it. One of the most critical bottlenecks in any rendering technique is managing coherency. The scene in a typical game may contain gigabytes of geometry and textures and it is important most of the time isn't wasted pulling the data in and out of the cache. No graphics article/post would be complete without at least one comment in the discussion section referencing the Matrix and how it's so close to becoming a reality. I guess that's optimistic considering we can't even predict the weather or have self-driving cars. I did see a few other comments, which I thought deserved a bit more follow up. Normal mapping is used when one wants to render limited geometry but apply a variety of normals the the otherwise flat surface giving the illusion of detail. The point of this is to use really high amounts of geometry to do the job. Normal mapping can't fix jagged silhouettes, for instance. Each corner of a voxel has a stored normal value, and since these voxels will be less than a pixel when evaluated, the interpolated normal between these eight points is satisfactory. I wish the article discussed how such a system would handle transparent objects and refracted light sources, such as an image of a glass of water. Ray casting like rasterization is very coherent. With rasterization the applicaition streams in geometry piece by piece and hopefully only has to do it one time. With ray casting, part of the octree that fits in a given area of the screen can be paged in, ray casted, and paged out of memory. 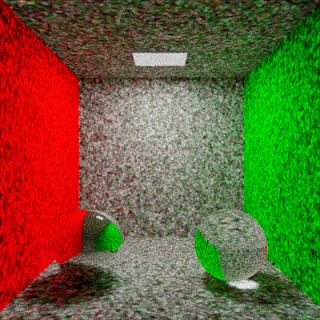 If you want to add secondary effects, many secondary rays leave the paged in part of the octree and need the geometry for that part of the scene brought it. And another secondary ray from the next pixel might shoot into a different part of the scene requiring another geometry fetch. That's why voxelized octrees won't get us any closer to ray-tracing-style secondary effects. It's just to give us more geometry. It's just to give us more geometry! IT'S JUST TO GIVE US MORE GEOMETRY! I'm happy enough with that. Even if it is only static geometry. Here's Jon Olick's demo video from Siggraph 2008. If you're wondering what those funky blocks are, those are the individual blocks of the octree paged in and out of memory. Great Article. Its an interesting point that about 10 years ago the whole market went to polygons instead of voxels. Who knows where we would be if the industry went that direction. Nowadays processors are becoming more and more capable of such a feat. I think the sweet spot is finding a mix of both... Maximizing both processor and GPU use in games. Its a heck of alot of programming, but thats why they get paid the big bucks to make games we love right? If the whole industry went this way 10 years ago we'd be playing a lot more beautiful chess games and fewer 1st-person shooters. I was at the conference when Jon Olick was presenting. Of course, someone had to ask the question, "How do you handle animations and rebuild your octree?". He simply replied that they're not out to solve a problem ray tracing researchers have been investigating for years. This only works on static geometry. This only works for static geometry! THIS ONLY WORKS FOR STATIC GEOMETRY! To get these voxels, they model in polygons, then sample them into voxels. To do this in a game with animations, they'd have to animate the character in polygons, voxelize, and render again to get all the data back. And from what Jon Olick has mentioned, voxelizing is too slow for real time and has to be precomputed. The idea certainly is to find the sweet spot. Rasterize animated geometry and ray cast static geometry. Developers can still model and rig everything with polygons and the engine can voxelize anything declared static. Voxelized objects lose the ability to deform, but are rendered faster. They can use the same surface shaders and even the same shadow maps, too. It can be completely transparent to the developer using the engine besides choosing what's static and what's dynamic. If the guys excitedly pushing this say it's not going to completely replace rasterization, they have no reason to lie, right? I personally still think the GPU is still best suited for rendering as most games now like Crysis are CPU-limited already doing other things like AI, physics, etc. Here's the full pdf of Jon Olick's slides. They're pretty complex and don't have many shiny pictures, but it was a great presentation. The best part of all this is the technology is available now on current hardware and will get more prominent as more and more developers become proficient in it.